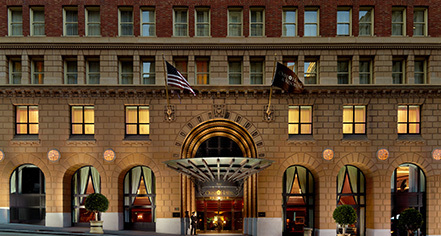 Ideal for a romantic getaway, the Omni San Francisco Hotel offers modern amenities in a boutique ambiance due to its Florentine Renaissance architecture. Built as a bank in 1926, the lobby is adorned with Italian marble, rich fabrics, and Austrian crystal chandeliers. This classic elegance makes the hotel the perfect location for a memorable wedding reception. Bob's Steak & Chop House has carved out a reputation as one of America’s great steak houses. From great food to attentive and seasoned wait staff, Bob’s Steak & Chop House offers an unmatched dining experience in the heart of San Francisco. Located just 30 minutes from San Francisco International Airport. 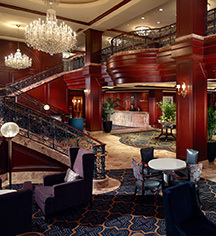 Omni San Francisco Hotel, a member of Historic Hotels Worldwide since 2014, dates back to 1926. Omni San Francisco Hotel is located right in front of the California Cable Car Line, the first moving National Historic Landmark. ATM: Available in hotel lobby. Deposit: The hotel accepts personal checks, cash, credit card and debit cards. If you are paying with cash, a $75 per day deposit is required for incidentals. The use of a debit card will initiate, at the time of check-in, an immediate deduction from your bank account for your room rate, inclusive of tax, for all room nights plus $75 per night for incidentals. Extra Person Fees: No fee. Hotel/Resort Fees & Taxes: All reservations may be subject to a City/State Tax of 16.445%. Parking: Valet parking: Available; rates vary per day of the week. Pet Policy: Service animals allowed: Yes. Pets allowed: Yes. Dogs only. Fees: $100.00 for the first pet, $50 for additional pet, per stay. Learn more about the History of Omni San Francisco Hotel .